Long time visitors probably saw this coming: I think Heavy Rain is an extremely flawed game. Starting with next week's podcast, I will take a break from ragging on Uncharted 2 and begin to make my case against Heavy Rain. For now though, I want to focus on my positive impressions of the game, both as a show of gratitude towards those that made it and as proof to everyone that my heart is more than a hollow, blackened husk. I admire Heavy Rain's willingness to take chances that differentiate it from other games both in terms of its narrative themes and gameplay mechanics. 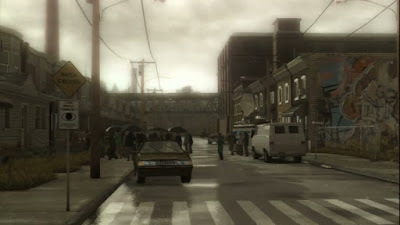 Thematically, Heavy Rain is an interesting mixture of familiarity and distinctiveness, and its unique gameplay helps deconstruct traditional conventions of player skill. As our friend, Steven, said: Heavy Rain "[attempts] to tell a mature story in a medium that is still fascinated with fantasy worlds and space marines." In a medium dominated by the fantastic, Heavy Rain's mundane characters and settings make it stand out. Games continually chase photorealism, but they usually do so in the context of impossible scenery. Realistically, it does not matter how detailed the aliens are in Gears of War; our rational minds know them to be fake. Heavy Rain's artistic style directly confronts the challenge of verisimilitude by attempting to depict the world in which we live. Whether it succeeds or not is debatable, but I admire the effort. The way Heavy Rain addresses mature themes also sets it apart "the swords, sorcery, and space" crowd. It's quite easy to forget that Kratos' journey began with his failure as a father, as we are only given that information in flashbacks in between blood baths. 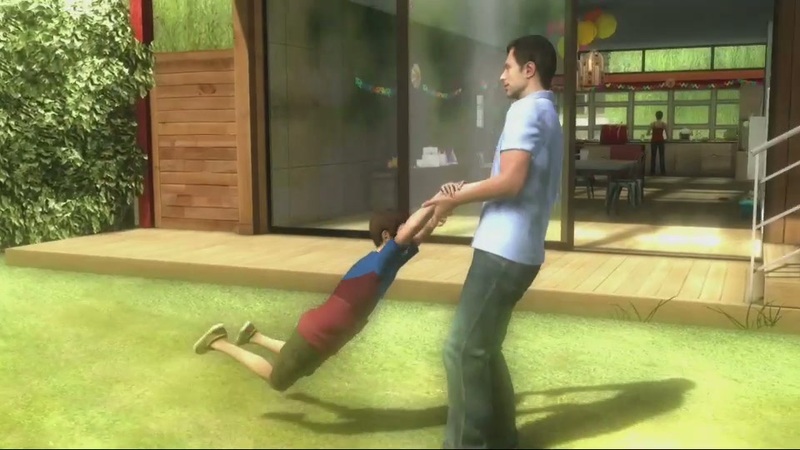 In Heavy Rain, the joy and pain of fatherhood is continually in the foreground and stitched through the game's challenges. Danger takes on a physical and emotional dimension, as failure means injury to both Ethan's body and his identity. Instead of an intergalactic doomsday device, everyday objects and situations are used to convey the fragility of life. Heavy Rain's story is by no means a unique one: the game owes quite a bit to mystery novels as well as films like Seven and Saw. However, the inclusion of well-known horror/thriller conventions gives the player the luxury of exploring familiar tropes in a new medium. We know what it means to walk through a creepy hotel or to see a shadow dart across the background. The meaning of such symbols is enhanced by the agency the game affords us. In Silence of the Lambs, the audience can shout at the screen to warn Clarice against entering the killer's trap; in Heavy Rain, our shouts are backed by the power of our controllers. How we use those controllers represents another of Heavy Rain's accomplishments. Whether it is the fear of failure, the uncertainty behind the button commands, or the drama behind unfolding as we press them, Heavy Rain rewards engagement. This is not a game to be played with one eye on the TV and one on Twitter: decisions must be made promptly and confidently, as mistakes cannot be undone. Cutting huge swaths of content from your game as a result of player choice and character death is a brave choice. While it has the potential to sour the experience for some, the narrative possibilities it provides demonstrate that immutable consequences make for interesting stories. While the game can be harsh, it is also subtlety welcoming for players of many skill levels. Since a mistake gives rise to a story rather than failure, players can learn how to play without having to sit through didactic replays and game over screens. Heavy Rain presents a subtle reinterpretation of traditional difficulty levels to strips them of their implicit value judgments. Instead of an "easy, medium, hard" scale, Heavy Rain asks the player about their familiarity with the controller and then adjusts the game accordingly. The game does not think of itself as "easy" or "hard," and instead focuses on its player and the tool they wield. The quicktime event itself is a remarkably useful tool for decoupling mechanical skill from narrative impact. The quicktime event strives to provide a standardized experience across skill levels. I like to think of playing games as a form of literacy: part of knowing the language is the "vocabulary" found in the buttons. The other part is how that vocabulary functions to create meaning. Just as poetry requires a robust vocabulary and an understanding of how different words affect one another, chaining together a string of jumps in Mario necessitates a mastery over the controller buttons and an understanding of their relationships. Quicktime events function like flashcards: whether you are studying for a first-grade alphabet quiz or a college entrance exam, the concept is the same. Heavy Rain is a vocabulary builder: An inexperienced player will likely feel the same kind of stress when trying to find and push a single button as an experienced player will when trying to find and push five buttons simultaneously. While Heavy Rain is not without its problems, I admire the bold choices it makes. I believe that offers such unique ideas and provokes such strong reactions from players is valuable, and I am more than happy to share the rays of sunshine I enjoyed while playing the game. I hope you enjoyed them too, as things are going to get a bit stormy from here on out.